1. What is your opinion of the value of presenting a problem before teaching students the method or formula? 2. 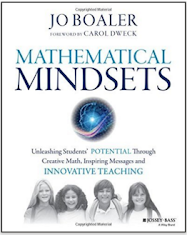 How will you inform parents about the notion of creating mathematical mindsets through open-ended tasks, and allowing student to first attempt questions at home as well - rather than having parents 'teach' their child how to 'memorize' (for example multiplications facts)? 3. If you are not yet using open tasks, how will you create and design open tasks in your math class this coming year? Indicate your grade as well please. 4. Do you feel your students are able to convince and reason skeptics? How will you model being a skeptic to assist their convincing? I think that having children problem-solve BEFORE they learn the "right/proper/etc" way to solve it is SO valuable - allows you to see what they already know, provides an authentic vehicle to learning, and can help the group understand mathematical reasoning. Does it always work in the way you planned? No, of course not, and you have to be OK with the inquiry! I think for parents, it's important to explain WHY you choose to do a problem-solving approach (for all the reasons above), and to explain that problem-solving and innovation are at the fore-front of essential life and job skills. In FDK, I would say that most tasks are open - we provide manipulatives and materials for exploration, and when a provocation is received by the child as task, the educators pop in and observe/document/question/extend/etc. I hope for my kindie students that they don't have any pre-conceived notions about their math abilities!!! However, I think the nature of FDK allows students plenty of opportunity to reason and communicate what they think and why... but often it's to an adult, and we need to foster those skills for peer communication! Peer communication and utilising peers is something that I hope to work more on this year. I feel we had a good start last year but it did not go as far as I would have hoped. I think this will required daily conversation as well as opportunities to practice utilising peers as a knowledge base. Last year I encouraged students to try on their own, ask a peer and then ask an educator. Do you have other suggestions? I think the idea of presenting the problem before teaching the method or formula lends itself to the nature of number talks. When students have no pre-conceived notions about what the answer is supposed to be, they explore different ways to solve the problem. I think it also helps students see the value in the formula afterwards - if they understand different ways of looking at the problem, then the formula becomes more than just something to memorize. They begin to understand the relationship between the formula and the solution, which helps develop better math understanding. Fortunately, so much of math learning in full day kindergarten is experienced through play and exploration with numbers and patterns. When I share with parents all of the ways students explore math throughout the day, they are amazed at what the students are learning to do and able to share. When I taught junior grades, I had many conversations with parents about how important it is for students to be able to communicate their solutions and reasoning - getting the answer right is only one small part of math. Students should be able to share their steps to getting the solution, and help others understand their way of thinking. As was mentioned above, most of our tasks presented to the students are open-ended. I love listening to the students reasoning when I pose a problem or question to them - it gives me so much more insight into what they already know and how I can build/extend on that. I really want to make sure my students are confident when it comes to math - more than I ever was. My goal is to encourage their discussions and make sure the classroom is a safe space for open dialogue about math talk. If they are able to defend their thinking with their peers, and are confident, they should be able to transfer those skills to others. I love the idea of students understanding the relationship between the formula and the solution. I wonder if students could share aloud their thinking as well as have a piece of documentation or a visual to share with peers. These methods could then be posted along with possible educator documentation to create a math reference wall that is truly authentic within the learning environment? Five years ago my current school division had a math team that gathered on a monthly basis. Teachers from pre-k to grade twelve were part of the group. Each table was made up of grade alike teachers. Problems would be presented and materials/manipulatives were available to show your thinking while you explained where you went with the problem. This experience was eye opening! One problem that I recall discussed how triangles can be used to create circles. Our table used manipulatives to create a circle, discusses how many triangles were required, discussed the size of the triangles as well as the circles (depending on which manipulative was used), and completed writing in regards to what we had done. On the other end... the grade twelve teachers had created a variety of mathematical equations in relation to triangles and circles. This was my first "ah-ha" moment in regards to one problem being suitable for any learner at any stage. At the kinder level I feel it is so important to offer invitations/provocations that allow a child to approach in a way that is meaningful yet challenging. I think of a post that I made to the facebook page... coloured containers, dice and numbers. Some students came at this problem with the measurement strand in mind and others saw this as a number strand problem. Not once did I instruct them on how to explore the materials, I simply watched them interact with one another and began to prompt them once they were on a determined path. When showing parents this experience by way of Seesaw and classroom facebook, many were excited to comment on the level of mathematics their child was engaging in. They even said they came home excited to share. I feel fortunate to have portrayed to parents the power of play! This year I will be teaching grade one math to my previous kinders. I am looking forward to extending tasks that we have already engaged upon as well as find new and intriguing invitations/provocations to share with them. I hope to have them take on more of a leadership role. I enjoyed in chapter seven how Boaler discussed on classroom taking the time to set up a culture of community by way of listening and speaking. I feel this would be an excellent way to begin the year. Jennifer Mason. I would love to know where to check out your postings for invitations / provocations.